Adhesive bonding is a viable technique for the assembly of mechanical components in industry. However, the choice of suitable techniques for testing such bonded structures, their durability and their reliability, is not always obvious and some tests can give strange, if not unreliable, results. We consider various methods available; their advantages & disadvantages. An overriding concern in the industrial use of adhesives is the (lack of) predictability of service life in many circumstances, which is often related to intrinsic defects within the bonded joint, the effects of which are exacerbated during ageing (moisture, fatigue, constant load, etc.). In Bordeaux, we have recently undertaken preliminary studies to understand better the effects of heterogeneities in bondlines and on substrate surfaces. Although still not representative of true service conditions, our "model defective" bonds show some very interesting behaviour, not least of which is the non-linear effect of zones of poor adhesion. Weak zones actually seem to "weaken strong zones"! Martin Shanahan obtained his first degree (physics) and Ph.D. (1974) in London, receiving a D.Sc. in 1997. After an initial period as post-doctoral fellow and junior CNRS researcher in Mulhouse, eastern France, he established a group on adhesion and related phenomena at the Ecole des Mines de Paris. 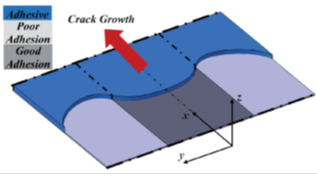 His work has covered both "hard" adhesion and composites, as applied to structural bonding of mechanical systems, and "soft" adhesion and wetting, at a smaller scale. He is on the editorial board of several journals in the field of adhesion and is presently professor at the Institut de Mécanique et d’Ingénierie at the University of Bordeaux.